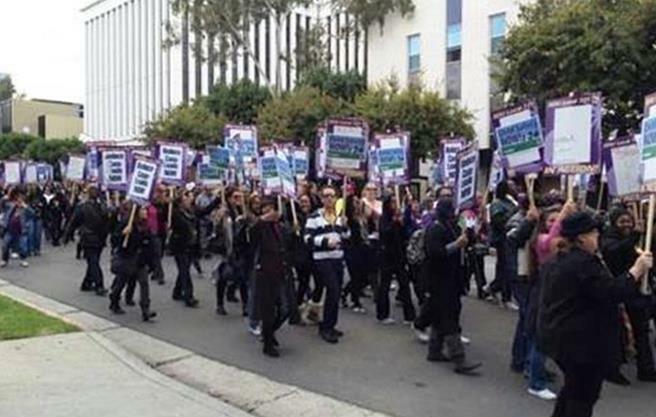 LOS ANGELES –Local child welfare workers took to the picket lines again on Friday to demand lower caseloads. A group of strikers met in front of the Lancaster office of the Los Angeles County Department of Children and Family Services (DFCS), and then headed to the DCFS headquarters in Los Angeles to join more than 1,800 children’s social workers for a huge rally. On Friday, County Public Affairs Director David Sommers said county officials were continuing to “actively monitor ongoing strike activity”. *Rather than focusing on the past two days of demonstrations by SEIU, our primary focus is ensuring child safety is not compromised. *Hundreds of experienced managers are serving the children of LA County right now by filling in on front line positions. * Striking social workers talk about protecting children, yet they’ve made the decision to walk out on the very children they’re responsible to protect. * These kids need their social workers during the holiday season more than any other time of the year, SEIU knows this, and yet they’ve walked away. * Everyone loses in this strike – 55,000 SEIU members that are not getting raises that other County labor groups are currently receiving, the striking workers who will never be paid for the days they were on strike, and most importantly, those who depend on the services we provide, children in this case, who are getting unnecessarily wrapped up into a matter they ought not to be impacted by, ever. * While these strike actions by SEIU continue, 100 new social workers are finishing up their intensive 52-week training academy and will receive a full caseload next month. * We are also finalizing the hiring of an additional 150 new social workers who will begin the training academy in January and February. * The best way to protect kids is to get back on the job, and immediately return to the negotiating table. For more information on the reforms proposed by county’s social workers, visit their union’s website here. Click here for a fact sheet, the group says will reveal the whole truth about social work in LA County. 20 comments for "County reaction to children’s social workers strike"
MAYBE THE DAM DCFS NEED TO STOP TAKING KIDS AWAY FROM THEIR OWN HOMES BECAUSE OF SOME B/S…YES THERE ARE CHILDREN OUT THERE THAT NEED TO BE TAKEN AWAY FROM THERE PARENTS…BUT MOST OF THE TIME ITS BECAUSE SOMEONE CALLED ON U..DCFS TOOK MY KIDS FOR 8 DAM MONTHS…BECAUSE OF SUM B/S THEIR GMA SAID I WAS ON DRUGS AND ALCOHOL…I DID SOME STUPID CLASSES..DID DAM NEAR 25 DRUG TEST..ALL NEGATIVE…AND THEY STILL KEPT MY KIDS..Y….BECAUSE OF THE DAM MONEY..THEY DONT GIVE A [removed] ABOUT THESE KIDS…ITS ALL ABOUT THE MONEY…MY 3 YEAR OLD WAS BOUNCED FROM 3 FOSTER HOMES…DO THEY CARE…NO….THEY NEED TO CLOSE SOME OF THESE CASES…CUZ U GUYS ARE ALL ABOUT MONEY….A DAM SHAME. what this person said is very true.i am going threw it also & it is just that about money! I personally would like to thank the social worker who took time out of her picketing to call me because she knew I was concerned about a situation involving my kids and their open case. She addressed my concerns and righted a wrong, all while on strike!!!! Thank you and I hope you guys get what you need! Is children’s court in Monterey Park open tomorrow? Please support us. Lower caseload does not mean Social Workers want to work less! It means we could provide better services to our families and better ensure the safety of our children! THEY NEED TO HIRE MORE SOCIAL WORKERS PERIOD! It has already been assessed that we cannot do our job with a caseload over 17. Why is it so difficult for a board of obviously educated individuals to understand? We currently have caseloads of thirtyfive to forty children and their families to serve with only a 40 hour work week? It’s just not possible! I’ve seen and heard some very hurtful and insulting comments regarding Social Workers and the Department. Our goals are never to separate children from their family unless there is a safety risk. When we do have to remove children our goal is then to address and remove the safety risk to reunify the family as quickly as possible. This often takes many resources and time, neither of which are readily available. When you consider the time Social Workers spend driving (sometimes hundreds of miles per day) to see their families, answering phone calls, referring to programs, consulting with doctors, dentists, therapists, attending IEP’s, scheduling meeting’s, contacting attorneys, dealing with concerned relatives, arranging visits, getting signatures, faxing, coping, filing documents, requesting and delivering bus passes/clothing allowances, reading new cases, minute orders, eligibility forms, resubmitting lost forms, finding resources for parents to court ordered programs (which are all full), gathering progress reports, arranging live scans, assessing homes, investigating referrals, writing reports and trying to figure out why someone’s Medi-Cal is cancelled…the list goes on and on. It’s crazy to say the least! Anyone who knows me can tell you I am not afraid of a challenge or hard work. Any other job I’ve ever worked I was able to rest knowing all I could do was the best I could do. When it comes to the safety and well being of our children however, we have to be able to do all and everything we can and we owe it to them to do it well! How can “they” believe that we can do this with only an hour or so per week for each child? How can “they” not give us the tools we need to do our job and tell us “they” are not going to” just throw more money at the problem” when we ask for more support? This is not just a problem it is a tragedy waiting to happen! We are losing good and experienced Social Workers that cost thousands of dollars to train because “they” lose hope that things will get better and quit rather than be responsible for the tragedies that are sure to come. I have heard it equated to being like a game of Russian Roulette in that it doesn’t matter how hard you try, the next full chamber (tragedy) might be yours. Please support this strike in any way you can. Honk as you drive by, call those that can make a difference, stop and wave a sign for a few minutes or just send up a little prayer for us and the families we serve. I know many of you have made comments reflecting negativity and an obvious misunderstanding of what a social worker is. The main part of our job is to ensure child safety and strengthen families. We do this by following and implementing policy, procedure and laws that we do not create to the best of our ability. While we are not always labeled as the “good guys” or always feel good about what we have to do, I guarantee you that you cannot do this job without being a good person with a huge heart who is willing to give your all. It was a difficult choice to go out and strike as it posed a hardship to the families we serve and to our own families at home. In the end though I had no doubt that it had to be done! I could have kept quiet and hoped the voices of those brave enough to speak out would make a difference but the voices of a few just aren’t enough. We all have to stand together and demand they acknowledge that caseloads this high are dangerous or we are failing the children and families we serve. I just pray that our message was heard. We are not making a request for lower caseloads for ourselves but to help us better serve and strengthen our families while helping to better ensure the safety of our children. PS..I find it crazy that our own President has said that the answer to bettering our economy is to create more jobs. Didn’t he even give out billions of dollars in bail out money to large companies to create jobs? Why is it then that they will not “throw money” our way to ensure child safety? By creating more social worker, HSA, Unit Clerk, and EW jobs wouldn’t we be strengthening our economy, lowering unemployment and better protecting and serving families? Why is it more important to save the automotive industry or bail out a bank that had no problem swindling home owners and throwing them on the street? I feel so bad for you social workers having to work all of these cases. I totally agree that something needs to be done about the welfare system in general. I wish you good luck with your cause. I do feel for you (dsfc workers) being over worked & the high stress your job must cause but as a parent whos children have been taken I ask that you guys recognize when a parent isn’t guilty of any type of child abuse at all that a financial strain has caused them to deem “endangerment” in a case & the records reflect full compliance with everything the court & dcfs has asked! every situation is different!!! How bout parents who parent?? Do you believe foster parents take in the abused kids because they want to better their broken lives…I don’t. It’s one hell of a paycheck and nothing more for so many who meet all of the requirements to become a “loving parent”. Sure there are some truly dedicated foster parents, but the dollar speaks for itself. If you house special needs kids…whew your talking big bucks. I was once inside of a case. Our original worker was a good man, just and fair. Unfortunately he was involved in an auto accident and could not return to work. His replacement was not a good woman, due to her own past. She had been abused by her father who I later found out resembled me closely. Five years of detrimental treatment did not help my relationship with children or wife. Five years of loss of pay due to appointments, and costs for therapy, etc. Five years of trying to support two homes as well. All due to a bad social worker. Those social workers calling for immediate hires need to take a step back and understand that comprehensive background checks to prevent problems like the one I and my children experienced are needed. The foster parents also need better background checks. I had one falsely accusing my children of stuff because she did not like them and wanted less active children. I have also personally seen children placed with child molesters and abusers, that is not helpful at all. Yes we need more workers, but we also need better programs to help out the troubled parents. We need better trained workers, not ones with chips on their shoulders. We need a village. yes these soc.workers tend to side with the foster families then don’t offer any assistance for reunification. I am curious if any of these negative commenters have actually read any of the supporting documentation for why the dispute exists. I am guessing not, as they seem to have very ignorant statements with no relevance to the actual issues at hand. In reading the arbitration case, it becomes clear that the County has consistently maintained an excessive caseload on the ‘Generic CSWs’ making their effectiveness severely blunted. This is in direct opposition to well documented and established best practices for optimum case management and child protection and even goes against the County’s own agreement, which was already in significant excess of that target caseload. This is not simply my personal opinion, but the official findings of the Adminstrative Judge in the arbitration between the County and the Union (you can read it yourself). We read in the news of all these cases of abuse and neglect that occur, then express our righteous outrage that our DCFS workers were not effective and didn’t catch it in time. Strangely, these same commenters that are right there to vilify the DCFS workers for ‘not doing their job,’ now want to vilify these same DCFS workers for insisting upon the help that has been legally established as needed for them to do their job more effectively. David Sommers says the children should never be impacted by this. I agree. And NOT hiring at least 1400 more social workers impacts the children EVERY day, not just this week. He keeps throwing around that 100 new hires, like it’s something. 450 new workers doesn’t even put us up to where we were 2 yrs ago. Our attrition rate is high. Our children deserve to be safe. Hire 1400 workers! I really do not understand a lot of the commenters. When a child suffers as a result of the shortcomings of DCFS, it is widely recognized that the department has detrimental inefficiencies. Then the workers bring forward very valid concerns of unmanageable case loads, and you call them lazy. This is not fast food or retail. This directly impacts the lives of children. When someone is given 40+ cases to manage, even the most qualified/competent social worker will not be able to keep up. I am not saying I know whether or not these people are competent or qualified. I am not defending the individuals themselves, but the issues they present are valid. have walked in their shoes. The county is a Bully. Lay these complainer off and save us tax payers a lot of money. This is a big problem with this nation all these socal deals going on. Parent should have to be responable first , then church, and then government . Wake up Amercia we are loosing our freedom! Right, because churches do such a great job with children. Just look at the Catholic Church. Anyway, I think it is so hypocritical for people to spout that “church” should be a part of someones life while at the same time saying social programs are bad. They may be run bad, I will give you that, but isn’t caring for others the righteous thing to do? The department needs to exist to protect children from unfit parents. Sure, parents should be responsible first, but unfortunately they arent. U stop walking around with a paper in one hand and a cup of coffee in the other, wondering when your next vacation day is (U know who U R). Lets say they did hire more people to do YOUR job…then you’ll be walking around with a paper in one hand and a cup of coffee in the other, wondering what to complain about next. Case loads would be a lot less if they got rid of all the slackers, they are the ones causing the over loads by not doing their job and pushing their workload off on others who are trying to make a difference. Clean up your own house before you ask for help, you would more likely get it. Looking at the picture! It doesn’t appear there over worked or stressed out!! Seems like it’s just an excuse for all the BS they’ve caused! I say lower there work load an ALSO THERE PAY! after all, we the tax payers pay your salary!!! Another thing is how seriously do you take your job , your out here an who’s protecting them kids!! GOOD JOB!